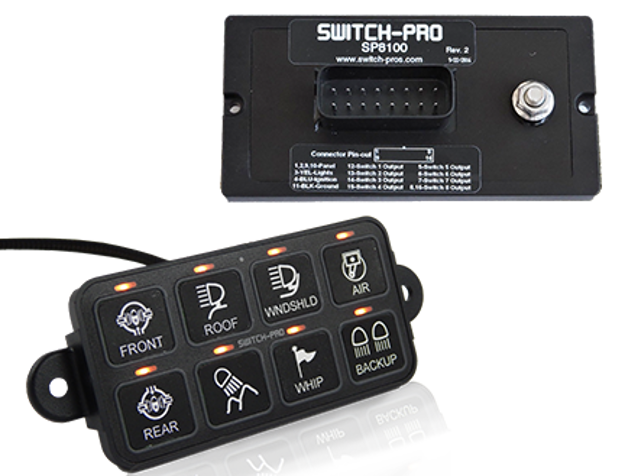 Putting an end to dashboard clutter is easy, with the Switch-Pro 8100 Switch Panel Power System. Featuring eight user-programmable switches, this compact panel is the most advanced and versatile on the market. Compatible with iPhone and Android based Smart Phones, you can command your vehicle accessories with the touch of your handset screen. Switches can be programmed to be: On/Off or Momentary, ignition or battery powered, flash, strobe, low voltage disconnect, and memorize previous settings. There is also a programming function to adjust the brightness of backlighting and indicator LEDs.